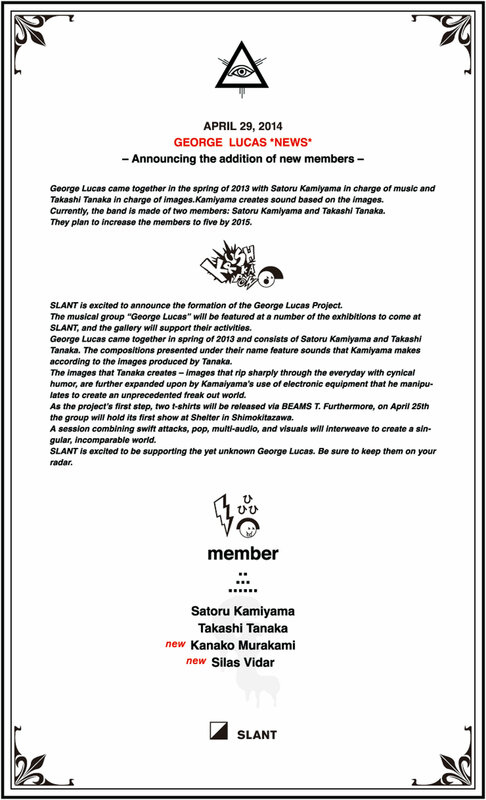 SLANT is excited to announce the formation of the George Lucas Project.The musical group “George Lucas” will be featured at a number of the exhibitions to come at SLANT, and the gallery will support their activities.George Lucas came together in spring of 2013 and consists of Satoru Kamiyama and Takashi Tanaka. The compositions presented under their name feature sounds that Kamiyama makes according to the images produced by Tanaka.The images that Tanaka creates – images that rip sharply through the everyday with cynical humor, are further expanded upon by Kamaiyama’s use of electronic equipment that he manipulates to create an unprecedented freak out world.As the project’s first step, two t-shirts will be released via BEAMS T. Furthermore, on April 25th the group will hold its first show at Shelter in Shimokitazawa.A session combining swift attacks, pop, multi-audio, and visuals will interweave to create a singular, incomparable world.SLANT is excited to be supporting the yet unknown George Lucas. Be sure to keep them on your radar.